I write this on ‘Blue Monday’, the day associated with winter doldrums, when holiday companies prey upon our sense of daylight deprivation, lack of exercise, divorce from life ‘out there’. It’s when I feel most like hibernating, so it was perhaps contrary to choose this time of year to travel 250 miles further north from my home in Perthshire’s heartlands. In Orkney this is the season of upended goalposts when empty frames stand on pavements as their swinging coffee signs are torn away by gales to announce a hiatus in hospitality. Days are defined by their extreme shortness. The sky lightened before nine on my first morning in Stromness and as I took a pre-breakfast stroll through the crooked streets to Ness Point, fishing boats chugged out of the harbour escorted by noisy fleets of gulls. Chattering crowds of starlings hurled themselves into the low branches of garden trees. There was frost on the ground and a pink horizon. I was afraid to go back indoors; blink, and I might miss the day, the sense of life awakening. Stepping out again an hour later to walk to the eastern shore of the bay, the wisdom of choosing this unseasonal journey clarified. The sun had risen low to the south and seemed to pierce deep behind my eyes as acres of clear blue domed above. Unobscured by high land, sunlight reflected from sheets of water. I walked and stopped. Walked and stopped. It was as if the place had been designed to capture light; I was inside a magical prism of glass worthy of a Philip Pullman novel. The previous night I’d stood out on the ferry deck as we came through Hoy Sound and been thrilled by the inky waters, the flashing beacons suggesting fragmented peninsulas, points, and islands. Today’s luminous contrast was exquisite. I suppose it’s simple: If you’re lucky enough to get sunlight here in winter, it will be magnified. And it’s a particular quality of light which is made more precious by its brevity, and by its earthbound angle. The essence of North. It soon became apparent that a charmed day was emerging, reflected in the wide-open eyes of all the people I met on foot and their generous greetings. 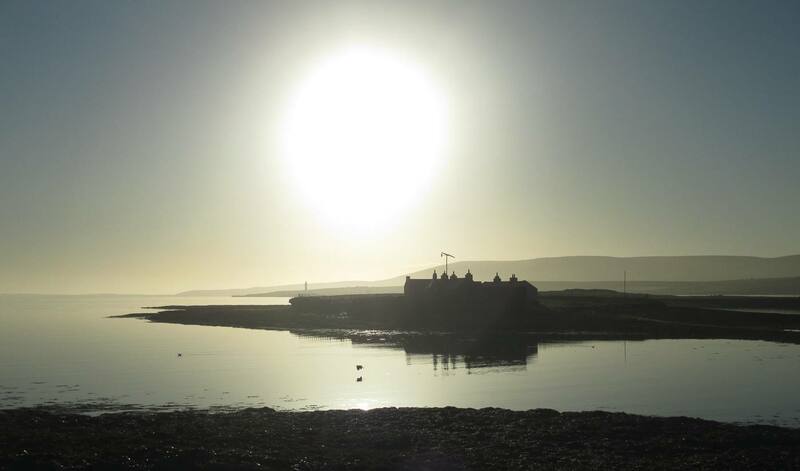 Over the past three years, Orkney has seen a major increase in coach-based tourism partly resulting from large numbers of visiting cruise ships. Further growth is expected. How lucky was I now to feel like the only tourist in town! People responded kindly and with curiosity to my being there; later a remote shopkeeper made me a cup of coffee, a thumb stuck out on a lonely roadside elicited a lift (once there was any traffic). An urgent need for intense light levelled us as humans and we tipped our faces towards the sun and talked about weather and place and time, pulled into an acute intimacy with primal rhythms. I’ve been to Orkney several times before, but always in summer when its many visitors marvel at its particular magic and long, light days. 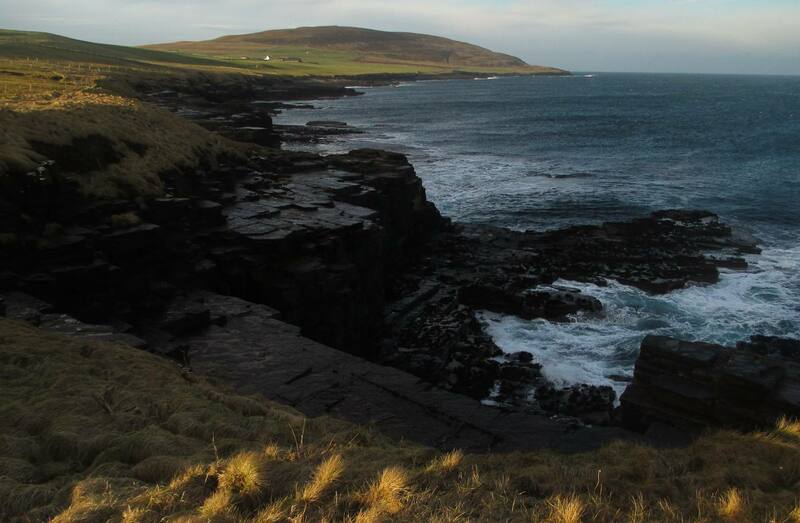 Having spent so much time in all seasons in Caithness across the Pentland Firth when writing a novel set there, many of the same features are recognisable here – the harshness and low-lying land, the phenomenal high-banked skies and scattered rural population, brochs, chambered cairns and the teasing manner of conversation. But perhaps here the convoluted jigsaw of land and water leads to something more concentrated. In this season it’s more like a kaleidoscope than a jigsaw. Wherever I go I walk partly to internalise landscape, but on this day it seemed the topography, architecture, the people even, were built from light and it was this luminosity which characterised the sense of place. Despite the long hours of darkness, or perhaps because of them, there was no sense of dormancy in nature. As I walked out of town redshanks waded the shallows, calling and running, awkward as long-legged schoolgirls. A group of wigeon slipped through the water in a chestnut glow. The air was so thrillingly still that birds seemed to have pirated the audio channels. Pausing at the point of the peninsula to note the walls that once outlined Copland’s shipyard where a new pier now services the tidal and wave energy experiments, I heard screeching and watched two herons flap slowly across the mirror between me and the inner and outer holms. Curlews contributed a higher note to the rich orchestra. My brain censored out the hum of the MV Hamnavoe from the harbour in favour of the busy shoreline tinkle and click: turnstones doing as their name describes, making up a gang with purple sandpipers. Meanwhile cormorants lined a rock in such still silhouettes I thought them at first the upward spars of a wrecked jetty. Even by midday the sun was only a little higher than the Hoy Hills as it made its passage West. I turned for the opposite shore and walked back through the town, not quite able to resist stopping off in Stromness Books and Prints where beautifully curated shelves reflect the geographical location and its historical and archaeological significance. It also showcases the creativity of those who live in inescapable engagement with coast and tide and season – the better-known George Mackay Browns and Amy Liptrots alongside books and pamphlets published by Duncan McLean’s Abersee Press which brings new writing from the Northern Isles to wider attention. If I was to spend many dark hours here, there was still much of the local to experience in them. There was still frost on the ground when I passed Ness Point again, the location of another historic shipyard. I took the path west along the southern shore, passing batteries which once defended Scapa Flow. 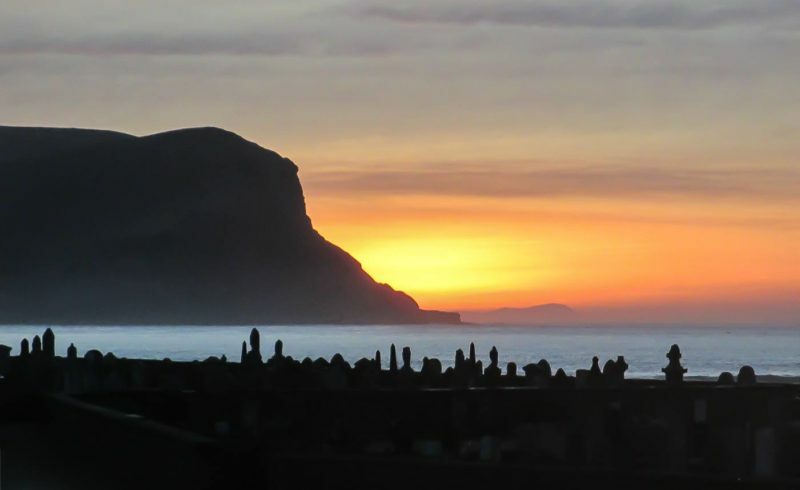 Not long after 2.30 the sun dropped from sight behind Hoy’s twin hills, but for a further two hours reflected light kept the place aglow. When I came just inland of Warebeth cemetery which balances on a small cliff a mile or two out of town, the ornate 19th-century headstones stood like a cosmic chess game backlit by a roaring sky. With the temperature dropping fast a hint of sea-smoke drifted under the dark Hoy cliffs. People were still arriving on the coast path to walk dogs, to watch the light change, making the most of it as the sea darkened, the Graemsay lighthouse pulsed more brightly and surf exploded white on nearby skerries. People who come to Orkney fall in love with it for wildlife, the rich ongoing archaeological discoveries of 6,000 years, World War history tangible in the coastal batteries and the wrecks. And the light of course draws artists. 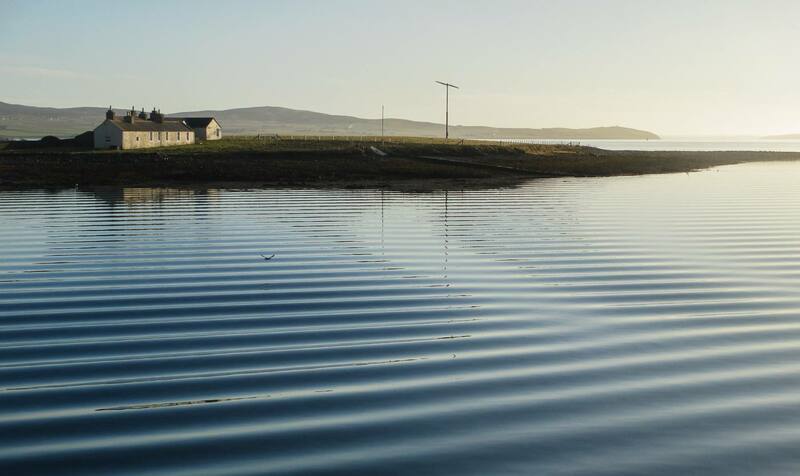 I was principally there to explore the history of a couple of Stromness shipyards and their connection to seafarers in my own family, a history entangled with a couple of infamous pirates. It was this that took me to that cemetery and then indoors into the archives in Kirkwall for a day’s detective work. And then, gloriously, I had another day to be outside. I kept to the mainland for practical reasons of time and weather and winter timetables. I wanted to follow more coasts and drink in as much light as possible, so I chose to cross the mainland’s north coast from Evie to Birsay, the route on which Saint Magnus’ body was carried after he was killed by an axe to the head on the nearby island of Egilsay. Although still bright and dry, the fickle weather now sent a brisk easterly to whisk up the sea and whip at me from behind. Despite these more ‘normal’ conditions, the thrill continued as my progress was monitored by seals, and I watched great slabs of sea sliding over stone pavements, waves crashing into deep geos, and passed stone relics including that of 11th century St Peter’s Kirk, gradually being dismantled by coastal erosion. The path mostly skirts between fenced-in arable land and the low-tide mark, sometimes high, sometimes low, and can be rough underfoot. Orkney’s red and yellow sandstone glowed against blue sea and sky, and armies of greylag geese lurked in camouflage in low fields of stubble. Sometimes their waddling convoys betrayed their presence; long-necked and bandy-legged as cowboys. But more often my arrival lifted them into the sky to circle in a dark, squabbling squadron. With a growing resident population swelled by overwintering Icelandic cousins, they are not welcomed by farmers. The geese, and then the flocks of starlings who coiled as one body into complex knots befitting their maritime setting, took my eyes frequently skywards as much as to the land and to the sea and to the islands of Rousay and Eynhallow opposite. Later peewits, also known as ‘teeick’ in Orkney, jousted in the air above the Loch of Swannay. Looking south in the early afternoon from the heathery high moorland of Costa, the Hoy Hills were turning misty and cloud had banked up in high columns. I knew storms were forecast. I’d been lucky but I was up against imminent dusk. It was the wrong state of the tide to cross the causeway to the Brough this time. I hurried on, snatched the last light on the rich red stone of the Earl’s 16th century palace which surprises with its sense of past grandeur in a remote and windswept spot. And then with glowing cheeks I made it onto the only bus of the afternoon away from Birsay, as mist and dark swallowed the land. ‘Blue Monday’ is deduced from an ‘equation’ factoring the number of days since the excitement of Christmas, one’s level of debt, the average temperature. It always points to the third Monday in January. I felt exhilarated to have resisted hibernation or a package holiday to the south. By going somewhere even darker, I’d somehow found more light; the right kind of ‘January Blues’ in all the drama of short but energising winter days in Orkney.